London, UK -- “I only came because of the name of the course,” admits the man sitting next to me. He has a point. “Entering Emptiness” is an intriguing title. 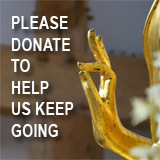 But it’s not the only reason I signed up for this six-week evening course at London’s Buddhist Centre. 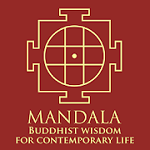 The programme is aimed at people who have already tried meditation, but want to understand the Buddhist principles behind it. I’m hoping to learn something. 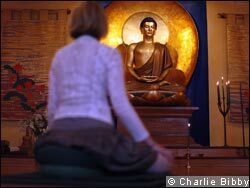 A student meditates in front of a gold BuddhaWe’re ushered into a bare room presided over by a huge gold Buddha, and lit with candles and incense sticks. There’s a rush for cushions and mats, as everyone makes themselves comfortable enough to sit on the floor for the next hour. The teacher sits patiently at the front. “We have a sense of there being something missing in our lives,” he begins. Buddhism has a neat word for this: “dukkha”, or dissatisfaction. But rather than bemoan the lack of religion or social structure in modern society, Buddhism has a more metaphysical solution – which we will learn after the tea break. Later, back on the cushions, the teacher explains. The solution boils down to the Buddhist belief that the self is a construct, just like the characters in a novel. As there is no permanent self to grasp on to, we need to look at this problem of emptiness, through meditation, and try to understand it. We need to accept that things are not fixed, including ourselves. It’s slightly unsettling to be told in an evening class that you are going to destroy your self, and that it will be a “terrifying” experience. In order to enter emptiness, we have to accept that our ego doesn’t exist, and that means letting go of all the ways in which we define ourselves. But, walking out of the class, I feel surprisingly happy. Losing my ego could be no bad thing.